I like nothing more than replacing the boots, snow shovels and firewood that litter my New England porch in the winter with colorful beachy items when summer finally rolls around. 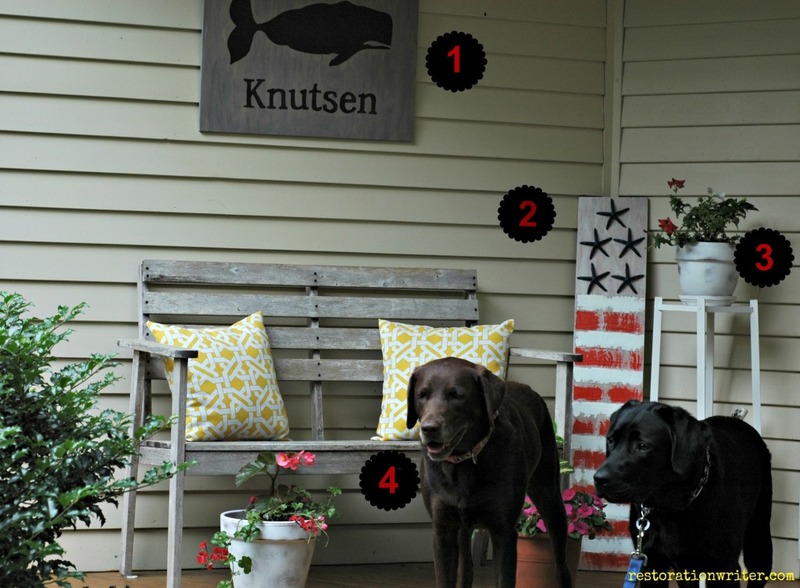 By the 4th of July, my potted plants are thriving and the cushions have returned to our weathered bench. My porch makes me happy every time I come home. But achieving a summery look doesn’t have to be hard. 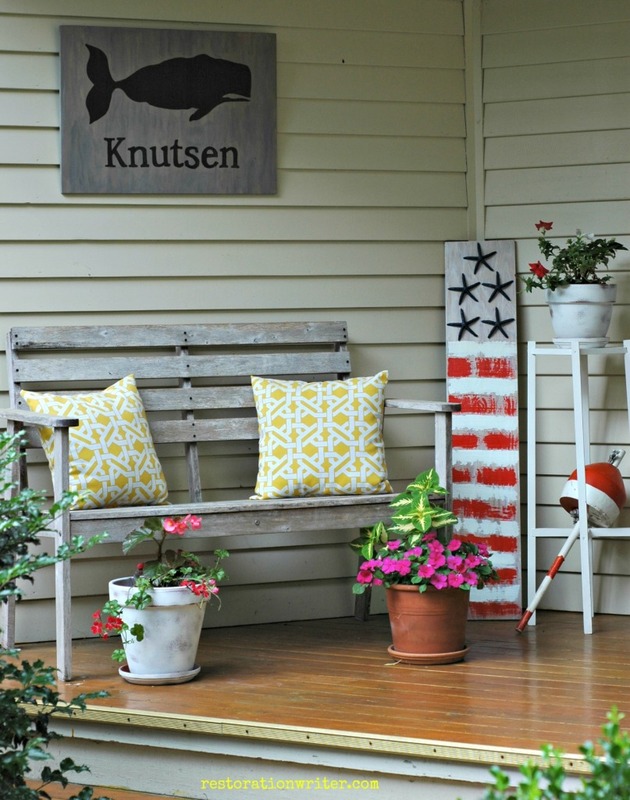 Here are 4 tips to pull together a cohesive look for your summer porch. If you have a few uncooperative dogs around, invite them in on the fun. Bonus points if you attempt to stage a dog you are watching for the week. 1. I equate images of whales with summer. 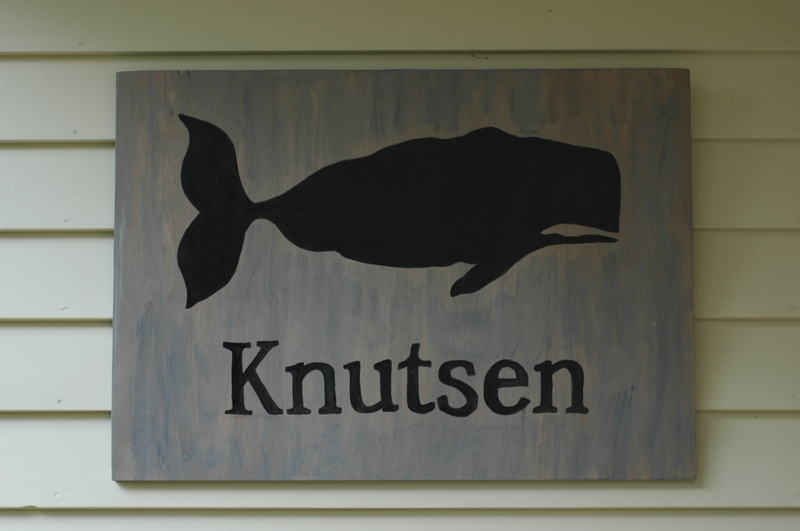 Inspired by a recent trip to Nantucket, I decided to take a crack at a whale sign to hang on the porch by our side entrance. I sanded a piece of leftover plywood in the direction of the grain with a sanding sponge. In a glass jar, I mixed black and white latex paint until it was a light grey. I added water to thin out the paint because I wanted some of the grain to show through on the plywood. I applied a few light coats, allowing it to dry between coats. Immediately after each coat, I wiped the surface in the direction of the grain with a paper towel to ensure the paint would go on sheer. After determining the dimensions of the whale, I drew the animal on a large piece of paper and then cut the image out. I traced the whale onto to the plywood. I printed out the letters for our last name, cut the letters and then traced them onto to the plywood, too. I used a small artist’s brush to paint the whale and the letters with black latex paint. 2. 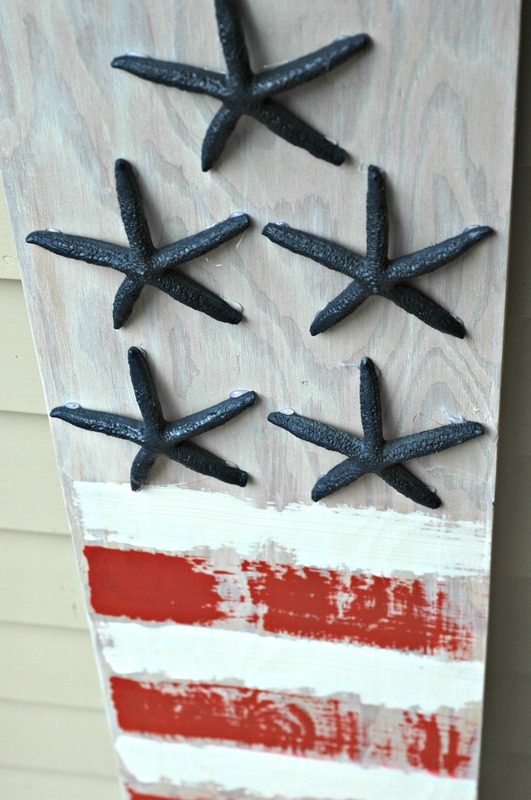 For the stars and stripes sign, I also used an old piece of plywood. This one was in pretty bad shape so it required a lot of sanding (It had some water damage at one end that had to be sanded out). Once sanded, I mixed white latex paint in a jar with water until I had a thin whitewash. I applied several layers of the whitewash, again wiping with a paper towel after each coat. Next I squirted red and white acrylic paint onto 2 paper plates (for easy cleanup afterward). I wanted the stripes to be airy and incomplete so I applied a small amount of paint to the 2″ paint brushes and swiped quickly. I spray painted 5 star fish with a Valspar satin paint and primer in one. I sprayed 2 coats of paint, allowing for ample dry time between. Once dry, I used my hot glue gun to attach them to the plank. 3. I love having lots of potted plants on my porch. 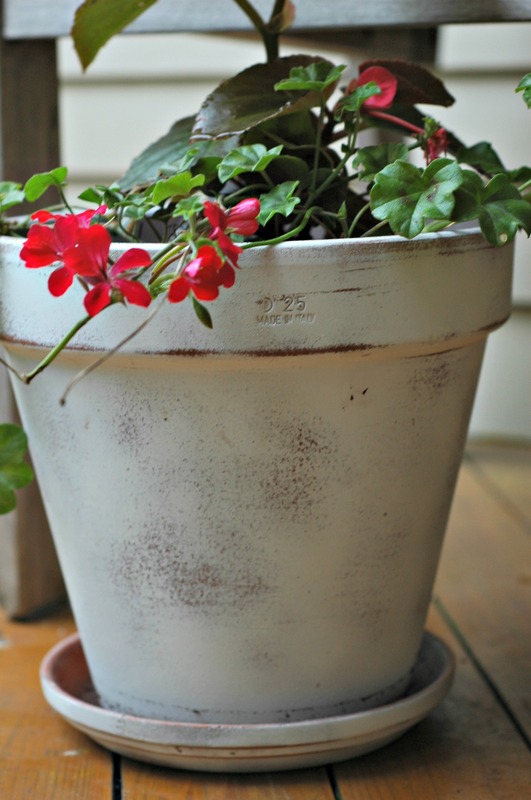 To give the terracotta pots a more cohesive look, I spray painted them with white satin spray paint. Once dry, I used a sanding sponge to distress parts of the pots and their coasters. Did you catch the last project I used these distressed coasters for? 4. You can never have too many pillows! These indoor/outdoor pillows made with sunbrella fabric don’t fade and because they are somewhat stiff, they keep their shape nicely. Be bold and choose bright colors and/or patterns. Have a little fun on your porch!